BORDERING ON ULTRA! 1 of only 61. Finding a 1960 proof Roosevelt in STAR CAMEO is tough! NGC has graded a total of 968 examples in ALL grades of cameo and out of those 968 examples graded only 141 have earned NGC's strict STAR designation. 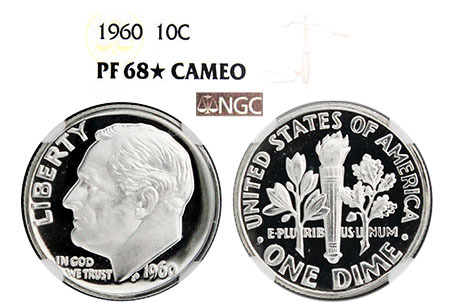 NGC has graded 288 examples in PF 68 CAMEO but there are only 61 certified in PF 68 STAR CAMEO. The obverse sports full ULTRA CAMEO devices. The reverse offers incredible CAMEO devices. SO close to ULTRA status. Pristine spot-free, haze-free, jet-black mirrored fields.